Doug, your host, is an avid cyclist and Confederation Trail Officer; patrolling a large eastern portion of the trail. A Trail Officer’s primary duties are to assist anyone using the trail, to supply information, trail maps, directions and first aid if required. 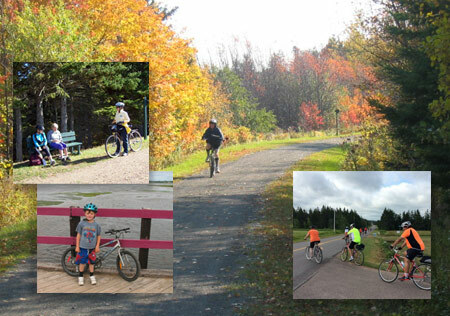 The Confederation Trail runs from Tignish in the north to Elmira in the East, a distance of 273 kilometers, referred to as “Tip to Tip”. The additional spur lines of the old rail bed bring the total distance to approximately 400 kilometers. A lot of cyclists like to do the tip to tip over a period of a few days stopping at B&Bs or other accommodations along the way. The Trail is exceptionally well maintained with a good riding surface; park benches are located along the trail, and approximately every 5 km or so there are covered picnic kiosks for your lunch breaks or snacks. The trail is well signed with km markers, places of interest, food & accommodation directions. Those wishing to ride the roadways will find flat and rolling hills. Cycling back roads you will be able to follow the bays, rivers and coast line. We can assist in planning day trips to suit your needs. We are members of the “Cyclist Welcome” program sponsored by Canada Select.